We founded this company over 15 years ago because we felt we could inject a sense of respect and urgency into the towing and recovery industry. Too often are people and companies subjected to dealing with faulty equipment, surly drivers, or a fundamental lack of care on the towing service’s part. Needing vehicular transport services is already a hassle, so why would anybody make it worse? We place a premium on our drivers treating you with the kindness and respect everybody deserves, earning your trust so that we can perform an efficient tow without sacrificing the peace of mind that is so valuable to any consumer in any industry. We keep our equipment in pristine shape, regularly servicing our vehicles to ensure nothing goes wrong on the road. We thoroughly screen our drivers, training them to provide the stellar service with a smile we know our customers deserve. Though we specialize in equipment transport for bigger companies, we offer our light, medium and heavy-duty towing services to individual clients along with roadside assistance and accident recovery. If you need a tow or equipment transport job done, call Certified Towing & Recovery. We’ll get it done. Needing a tow, fuel delivery, equipment transport, or any other kind of vehicular service is often an undue burden. Sometimes it seems that nobody likes getting it done, and yet it still needs to get done. Certified Towing & Recovery has been getting these kinds of jobs done for 10 years and counting, so our clients can rest assured we possess the experience and work ethic to provide quick, friendly service to any customer. Our level of experience also gives us the perspective to be able to offer our services to companies, municipalities and individuals. 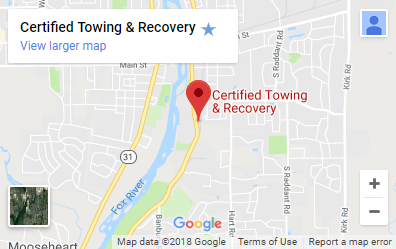 Since day one, Certified Towing & Recovery has been focused on offering the highest-quality services at the most competitive prices, and we like to think we’ve done well committing to this mission. There’s a reason our clients keep coming back to Certified Towing—we get the job done, quickly and personably. They arrived very quickly after a car crash and did a great job hauling away and cleaning up after the accident. I had liability only insurance, they ended up giving me a massive discount, though it was still expensive. They provided fantastic service and were very helpful, answering questions I didn't think to ask, since I was sick at the time. I've never been so pleased with a towing service. We have been using Certified Towing for about 7 years. We have always received timely responsible service. Keep up the great work! Owner is amazing. Office manager extra amazing.